Yes, you can upgrade, downgrade, or cancel your plan at any time. If your hiring slows down, you can downgrade your account at any time. You can’t get job seekers by just posting to one job board. We post every job to 50+ platforms that way your job can be in the front of millions of job seekers. You better clear off your calendar! Create a company culture page that showcases your amazing company culture. Job seekers are more willing to apply to a job when they can visualize themselves working at your company. They give them a reason to work at your company. Create a custom company profile page that is viewable right on LocalWork.io OR you can embed it right on your careers page in your company website. You want your job posting to attract a lot of great candidates. 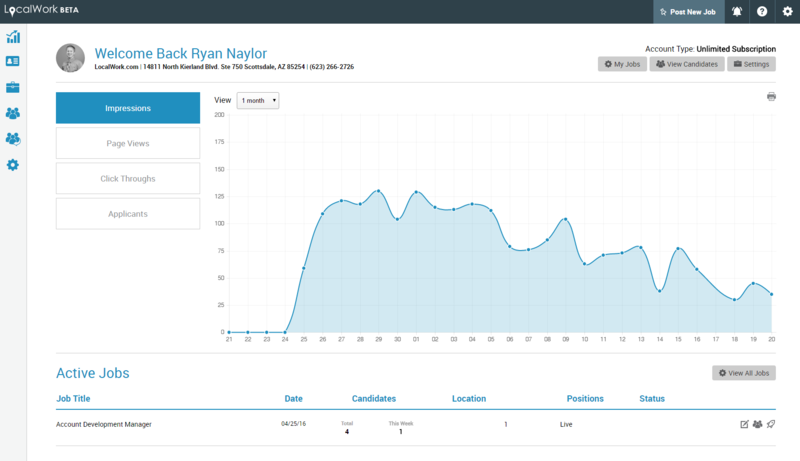 Our analytics will give you an in-depth look at what job seekers are doing on your job posting. Easily update statuses of multiple applicants at once. Bulk actions allows you to select as many applicants needed to perform one action. Update a status, Add a note, or even send the same exact email to all of the applicants.